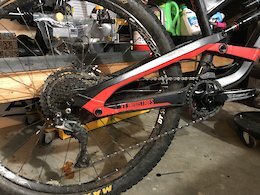 2018 YT Capra AL Comp 29 Size Large 160mm front/rear Lyrik RCT3 Super Deluxe Code R brakes SLX shifter and derailleur E13 cassette and dropper Brand new 29x2.5 DHF on the front, 2.4 DHR II in the rear set up tubeless with Orange sealant. Will include another brand new still in package DHF 2.5 and Aggressor 2.5 combo Also will throw on a brand new set of sensus grips (black w/ red lock rings to match bike) WTB Silverado pro saddle but will include stock SDG saddle too. RF Atlas 40mm length stem, still have stock 45mm RF stem if you would like that. Still have the YT box so I could ship, should be roughly $150 with bikeflights depending on location. Paypal FF only. Bought the bike new from YT USA in June 2018. I've ridden 2-3 times a month since then. Looking to upgrade to carbon and go with a shorter travel bike. Everything works and functions as it should. There are very few small marks on the frame at the rear axle area and some small marks on the fork where the graphics are. Derailleur has some marks but works great. Cranks are scratched up from pedal strikes but the rubber covers that Raceface makes would cover that all up. full spec available on the YT site.